Faculty | New Brunswick Youth Orchestra, Inc. Described by the Saint Louis Beacon as an artist “with grace, authority, and seamless virtuosity”, American clarinetist Andrew George began his studies under Saint Louis Symphony clarinetists James Meyer and Scott Andrews. He then continued his studies in Canada, receiving a Bachelor of Music Performance with Distinction from McGill University and an Artist Diploma from the Glenn Gould School, studying with principal clarinetists Robert Crowley and Joaquin Valdepeñas, respectively. Andrew has also had the opportunity to perform as an orchestral musician throughout the United States and Canada, under the baton of notable conductors David Robertson, Johannes Debus, Tito Muñoz, Alexis Hauser, and Jean-Philippe Tremblay among many others. Currently he can be found performing with Symphony New Brunswick, the Tutta Musica orchestra, and in the Saint John based chamber group Port City 5. In addition to performing, Andrew is also an avid teacher and has been the Resident Clarinet Teaching Artist for Sistema New Brunswick’s Saint John Centre for the past five years. Jessica Spencer grew up in Milton, Ontario, and completed her Bachelor of Music on the trumpet at Wilfrid Laurier University studying with Larry Larson, Guy Few and Anita McAlister. During her degree Jessica also studied a year abroad at Das Institut für Musik Hochschule in Osnabrück, Germany. She completed a two-year intensive directive study in conducting with Dr. Jessica Kun, during which time she held the positions of Assistant Conductor with the Wilfrid Laurier University Wind Orchestra, and the Kitchener-Waterloo Youth Orchestra alongside Daniel Bartholomew-Poyser. In 2014 she participated in the Sherborne Summer School of Music Wind Orchestra Conductors program in England with Mark Heron, and in 2015 she held a Fellowship in Conducting at MusicFest Canada with the Denis Wick Canadian Wind Honour Band alongside Gillian Mackay and Mark Hopkins. Jessica has enjoyed performing regularly as a freelance artist as well as with professional orchestras in the Southern Ontario region including the Guelph Symphony Orchestra, the Stratford Symphony Orchestra and the Kitchener-Waterloo Chamber Orchestra. She was also member of the Hannaford Youth Brass Band, the Halton Youth Symphony Orchestra, the Kitchener-Waterloo Youth Orchestra and the Chaplin's Brass Quintet. She is now a teaching artist with Sistema NB as conductor of the wind orchestras and intermediate children's orchestra in Moncton. As well as performing with Tutta Musica, Jessica is a founding member of East Coast Brass, New Brunwick's newest professional brass quintet. Victor Vivas was born in Venezuela and began his music studies with El Sistema, where he was able to develop both his individual and ensemble playing skills from a very early age. Victor completed his violin studies at the Academia Latinoamericana de Violin in Venezuela with Jose Francisco Del Castillo, then later at the Kayaleh Violin Academy in Switzerland with Habib Kayaleh. He has participated in masterclasses with many acclaimed pedagogues, including Viktor Pikaisen, Laurence Kayaleh, Virginie Robilliard, Aaron Rosand and Olivier Charlier. As an orchestral violinist, Victor has performed with the Jeunesses Musicales World Orchestra, the Mediterranean Youth Orchestra, Soloistes de Genève, and was a member of the Orquestra do Algarve and the Simon Bolivar Symphony Orchestra under the direction of Gustavo Dudamel, Claudio Abbado, Benjamin Zander, Rafael Fruhbeck de Burgos, Sergiu Comissiona, Placido Domingo, Keri-Lynn Wilson, Alexander Shelley, among others. Victor has ten years of teaching experience with the main El Sistema violin academy: Academia Latinoamericana de Violin. Many of his former students are currently professional musicians in France, Switzerland, Sweden, Spain, Colombia, Venezuela and Argentina. Victor Vivas joined Sistema New Brunswick in January 2018, as the Fredericton Centre Director. Danielle Sametz grew up in Regina, Saskatchewan where she began her musical studies on both violin and piano. During her time in Regina Danielle was a member of the Regina Symphony Orchestra and also completed her Associate of the Royal Conservatory of Toronto certification studying with Dr. Jamie Syer. She successfully completed her Bachelor of Music from Brandon University (BU) in 2009, studying with Kerry DuWors and Mark Rudoff. Danielle was a member of the string quartet-in-residence at the Centre for Opera in Sulmona, Italy, has collaborated with Winnipeg rock band 'From the Moon' on their album The Cyclist, was a Saskatchewan representative at the National Arts Program of Canada during the 2009 Summer Games and travelled to Palestine and Israel for a concert series and tour with faculty of the Edward Said National Conservatory of Music. After finishing her master's degree at the Aaron Copland school in New York City she spent 18 months in South Africa playing with the KwaZulu-Natal Philharmonic Orchestra. Danielle is currently second violinist with the Saint John String Quartet and Symphony New Brunswick. Christopher Buckley, a native of New Brunswick, finished his studies at the Guildhall School of Music and Drama in London, England, and has returned to enrich his home province as a performing violist. Buckley maintains a large roster of private students, performs in school concerts, and coaches youth orchestras. He has been a member of the Saint John String Quartet (SJSQ) and Symphony New Brunswick for 25 years and a Musician-in-Residence UNB Saint John for over twenty years. A frequent volunteer of his time and talent, Buckley has received the New Brunswick Merit Award for his contribution to arts and culture. Before returning to Canada, he performed with the BBC Scottish Symphony Orchestra, the Ulster Orchestra in Northern Ireland, and was the violist for the resident quartet in Bermuda (Menuhin Foundation). Sasha Saika grew up in London, Ontario, where he completed his Bachelor of Musical Arts with honors in Composition at Western University. He studied bass performance with Jeffery Stokes and was a member of several of the university’s ensembles such as the Symphony Orchestra and Baroque Ensemble conducted by Joseph Lanza. Since moving to Canada's East coast, Sasha has participated in the Scotia Festival of Music, performed and toured with Tutta Musica, played in opera productions at the Université de Moncton, and is currently in his third year as teaching artist for Sistema New Brunswick and the New Brunswick Youth Orchestra. 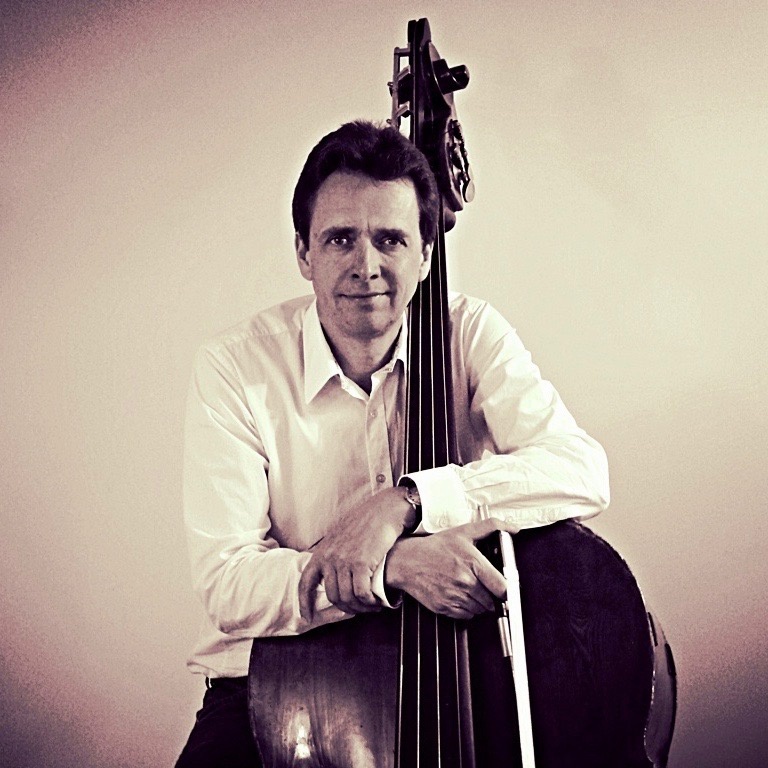 Louis Garson grew up in Saskatchewan and earned his BMus in Double Bass Performance from the University of Toronto. His principal teachers have included Thomas Monohan, principal bass Toronto Symphony; Stuart Knussen, principal bass London Symphony Orchestra and Leonard Stehn, Professor at Guildhall School of Music in London, England. Louis joined the Windsor Symphony upon completion of his formal studies, and later went on to work for the Hamilton Philharmonic and Kitchener-Waterloo Symphony Orchestras as well as the “Phantom of the Opera” orchestra in Toronto. Never far from teaching, Louis also taught double bass at Glenview Secondary School and Oakwood Colligates in Toronto. In 1991 Garson moved to the UK, where he performed full time for twenty years and worked with the Royal Philharmonic Orchestra, the Bournemouth Symphony Orchestra, and The London Philharmonic. During this time, Garson was also invited to work with The Philharmonia Orchestra, The Royal Liverpool Philharmonic Orchestra, BBC Scottish Symphony Orchestra, The English National Ballet Orchestra, and many others. He has performed with renowned conductors such as Valery Gergiev, Yuri Termirkanov, Lorin Maazel, Kurt Masur, Guiseppe Sinopoli, Andre Previn, Neemi Jarvi, Simon Rattle, Yehudi Menuhin and Danielle Gatti and Charles Dutoit, and has toured extensively throughout Europe, as well as South Korea and the United States. Since returning to Canada, Louis has worked for Sistema New Brunswick and The New Brunswick Youth Orchestra. He currently resides on Prince Edward Island and retains an online coaching and teaching presence. He performs with Symphony Nova Scotia, New Brunswick Symphony and is a founding member of the Atlantic String Machine. Angela Mosher Phi is thrilled to be coaching the NBYO flute section this year. She has been working with the NBYO organization for the last 8 years as the Flute Teaching Artist in Moncton's Sistema Program. Originally from Nova Scotia, where she started playing flute in Grade 9, Angela has lived in Moncton and raised her 3 boys there for the last 17 years. Her primary flute teachers were Sandra Britten, Bindy Code, Carolyn Christie and Philippa Fullerton-Finch. She completed her M.Mus. in Flute Performance at the University of Calgary in 2000. Recognized for his refined sound and musicality, oboist Carlos Avila is a soloist and chamber musician living in Saint John, New Brunswick. Born in Venezuela, Carlos began studying piano and saxophone at age eight, and oboe at age fifteen in the El Sistema Venezuela program. Before moving to Canada, Carlos was Principal oboe of the Nueva Esparta Symphony, and performed with the top professional orchestras in Venezuela, including the Simon Bolivar Orchestra. Carlos attended the Simon Bolivar Conservatory of Music in Caracas and holds a BA in Computer Science. He has been performing with Symphony New Brunswick since 2017, and is a former Teaching Artist for Sistema NB. Born in Bathurst, New Brunswick, clarinetist David Scott is an Artist Diploma recipient from McGill University’s prestigious Schulich School of Music and has earned a Bachelor of Music in Performance at the University of Western Ontario. He has studied under the tutelage of many world-renowned clarinetists, including Jean-Francois Normand, Robert Crowley, Jana Starling, and Wesley Ferreira. David currently performs with Tutta Musica, and is a founding member of the Bathurst Chamber Orchestra. He has played with orchestras around the world, including the Orchestre philharmonique des musiciens de Montreal, Orchanik Chamber Orchestra, McGill University’s Contemporary Music and Free Improvisation Ensembles, as well as the Scotia Festival Orchestra and the AEDO International Opera Festival Orchestra. He has shared the stage with the musicians of Symphony New Brunswick and Orchestra London Canada. With a keen interest for clarinet pedagogy, David is currently the clarinet Teaching Artist at Sistema NB’s Moncton Centre as well as the clarinet sectional coach for both the Moncton Youth Orchestra and the award-winning New Brunswick Youth Orchestra. As a sought-after clinician, David has been a faculty member at Ventus Machina’s Wind Master’s Workshop, VIVA! Arts Camp, and a faculty assistant at the Interprovincial Music Camp. Additionally, he has coached the clarinetists of the Bathurst Community Concert Band, the Montreal New Horizons Band, the London (ON) New Horizons Band, and the Bathurst High School Concert Band. Neil Bishop is a reed-making recluse from St. John’s Newfoundland. He began playing the bassoon in 2006 with the Newfoundland Symphony Youth Orchestra and performed with the Newfoundland Symphony Orchestra in their 2007-2008 season. In 2008, Neil moved to Toronto to study at the Royal Conservatory’s prestigious orchestral training program, the Glenn Gould School (GGS). While attending the GGS Neil had the privilege of studying with many of Canada’s top pedagogues and performers, as well as performing with the Royal Conservatory Orchestra. Neil diversified his career as a bassoonist when he became part of the world’s first electric bassoon quartet cover band, Das Fagott Mannschaft (DFM). DFM performed at a various venues, special events, and music festivals across Ontario, notably ScotiaBank’s Buskerfest, Sudbury’s Northern Light Festival, Toronto Pride, and the Toronto Jazz Festival. In 2017 Neil relocated to Saint John to join Sistema New Brunswick, where he established the Saint John Centre bassoon studio. Neil is thrilled to be coaching the NBYO bassoon section this year. Vancouver native Jonathan Fisher has worked his way across the country, pursuing studies at the University of Calgary, The Glenn Gould School of The Royal Conservatory of Music, and finally the University of Toronto. His diverse interests in music, both old and new, have landed him in a variety of performance settings. He is equally at home performing from the middle of a lake or in an old parking garage as he is on stage at a concert hall. Jon is an experienced orchestral musician, having performed with the Calgary Philharmonic Orchestra, the Atlantic Sinfonia, and the Youth Orchestra of the Americas. He can currently be found performing regularly with Symphony New Brunswick and Tutta Musica, the performing ensemble of the Teaching Artists of Sistema New Brunswick. Since situating himself in the city and musical community of Saint John, New Brunswick, Jon has enjoyed a rich and fulfilling musical life, becoming highly active across the province as both a performer and an educator. In addition to his work with Symphony New Brunswick, he has had the pleasure of performing chamber music with the Lighthouse Brass Quintet and Ventus Machina, New Brunswick’s premiere woodwind quintet. Jon also has a healthy studio of private students on piano and horn, manages the Saint John Youth Orchestra, and is the Music Director of the Saint Mary’s Band. A devoted teacher, Jon is on faculty with the New Brunswick Youth Orchestra and is the resident Horn Teaching Artist for Sistema New Brunswick’s Saint John Centre. This is where he discovered his true pride and joy: his students. They mean the world to him and he is thrilled to witness their continued growth and exceptional achievements on a daily basis. David Parker is Principal French Hornist of Symphony Nova Scotia. He has been a member of orchestras in Kitchener-Waterloo, Barcelona, Quebec City, Israel, and Mexico City. He has also performed with the Toronto Symphony, the Hamilton Philharmonic, the Boston Lyric Opera, the Boston Pops, Tafelmusik Baroque Orchestra, and Les Violons du Roy. He is a graduate of Boston University, the University of Toronto, and Acadia University. Mr. Parker is a member of the Canadian National Brass Project, and has appeared in numerous chamber music festivals, including Scotia Festival of Music, the Toronto Chamber Music Festival, the Ottawa Chamber Music Festival, the Festival of the Sound, and the Bathurst Chamber Festival. Mr. Parker teaches French horn and brass performance at the Fountain School of the Performing Arts at Dalhousie University. Originally from Ottawa, ON, Conor Conway has been teaching and performing trumpet for over 10 years. Currently employed by the New Brunswick Youth Orchestra, Conor teaches children in the Moncton Sistema Centre, Moncton Youth Orchestra and NBYO. With a versatile background of classical, jazz, hip hop and RnB, Conor brings a dynamic and engaging teaching style to his sections. Having studied at Humber College in their Contemporary Performance degree as well as with orchestra members from across Canada, he now performs regularly with Tutta Musica and East Coast Brass. Conor is excited to be back coaching the NBYO Trumpet Section for another year. Originally from Hammonds Plains, NS, Kimberley (Shields) Conway is a driven and passionate trombonist, teaching artist and manager. As a trombonist in solo, chamber, jazz and orchestra, she currently performs most frequently with East Coast Brass and with Tutta Musica. Kim earned for Bachelor of Music degree from Mount Allison University and a master's in Trombone Performance from the University of Ottawa. As a teaching artist, Kim's experience ranges from elementary to university ages in individual, small groups, orchestra and classroom settings. She currently teaches over a dozen trombonists from Sistema NB, Moncton Youth Orchestra (MYO) and NBYO. As a manager in the arts, Kim has experience in coordinating tours, recruitment, auditions, stage managing, sound and video recording, grant writing, music libraries, social media, and general management of young musicians, their families and faculty. Kim is currently managing and performing with East Coast Brass and was orchestra manager of the NBYO from 2014-2018. Gregory Irvine, a native of Nova Scotia, was Principal Tubist of the Hamilton Philharmonic Orchestra for eleven years. During this time, he also performed with such ensembles as the Toronto Philharmonic, Toronto Pops, and CJRT Orchestras. He has performed extensively as a tuba soloist, and in chamber ensembles including the Royal Brass of the Hamilton Philharmonic, and the Aeolos Brass Quintet, who toured throughout Canada during the 1980s. Dr. Irvine has studied his instrument with some of the finest and best-known tuba players in the world, including Charles Daellenbach of the Canadian Brass and the late Arnold Jacobs, legendary tuba player of the Chicago Symphony. His combined interest in performing and teaching led him to further study in these two subjects at Northwestern University, from where he earned both master's and Doctor of Music degrees. Dr. Irvine's teaching responsibilities in the Music Department at UPEI include teaching applied brass, instrumental conducting, brass techniques and some music history. He continues to perform regularly as the tubist for the P.E.I. Symphony, Symphony Nova Scotia, and Symphony New Brunswick. Ian Gibson is a graduate of the University of Toronto where he earned both his BMus and MMus in Percussion Performance. After graduation, Ian went on to become the Head of Percussion at Cambrian College and the Classical Percussion Instructor at Laurentian University from 2005-2017. During this time, he also served as the Principal Percussionist/Timpanist with the Sudbury Symphony Orchestra. Ian has presented numerous solo and chamber performance during his career; some performance highlights include Drumming by Steve Reich with Nexus at the Percussive Arts Society International Convention, soloist for both the world premiere of Rosewood Dreaming (full orchestra version) for Solo Marimba and Orchestra by Bill Cahn, and the Canadian premiere of Concerto for Marimba and Choir (with Percussion) by Gene Koshinski. Ian is currently the Percussion Teaching Artist for Sistema NB in Saint John, New Brunswick and is proud to be an sponsored artist for both Innovative Percussion and Pearl Drums/Adams Concert Percussion.